ASE, a reference company in the proposal of professional components for automatic identification, presents the new readers A8C71 and A8C72, portable RFID readers HF-UHF-Barcode, designed for logistic and / or industrial applications. The A8C7X portable players guarantee robustness, practicality, lightness and IP65 protection. Suitable for resisting falls and harsh environments such as industrial or outdoor, as required, for example, for the “Waste Sorting”. With the Android operating system, its integrated Quand-core processor and 4G, Wi-Fi and Bluetooth communication systems, these devices are easy to implement in the various industrial needs. A8C71 can also contain, together with the NFC system (default), the UHF RFID module with circular antenna, reaching reading / writing distances of about 1m. A8C72 as the A8C71 reader can have a UHF RFID module inside, but thanks to the circular antenna, located outside the reader body, and the RFID module Impinj R2000, it is possible to guarantee high performances with readings up to 10m away. 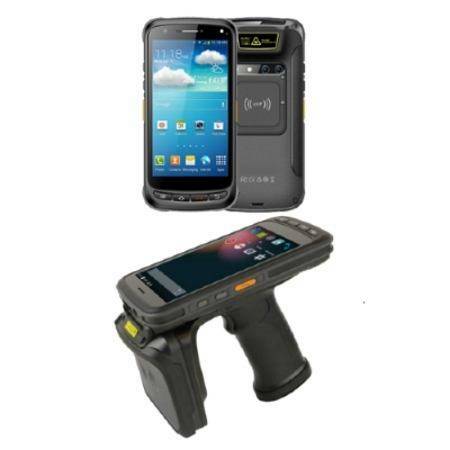 In both handsets, you can insert 1D or 1D / 2D barcode readers, fingerprint readers and IRIS scanners inside. Many different accessories are also available, to make the use of laptops daily, simple, practical and productive, to the operator called to provide the requested service.